This issue of Street Sign Language Lesson ™ includes: discrimination against ugly waiters, the plague, gross anti-smoking images, and interesting baby food choices in Italy. 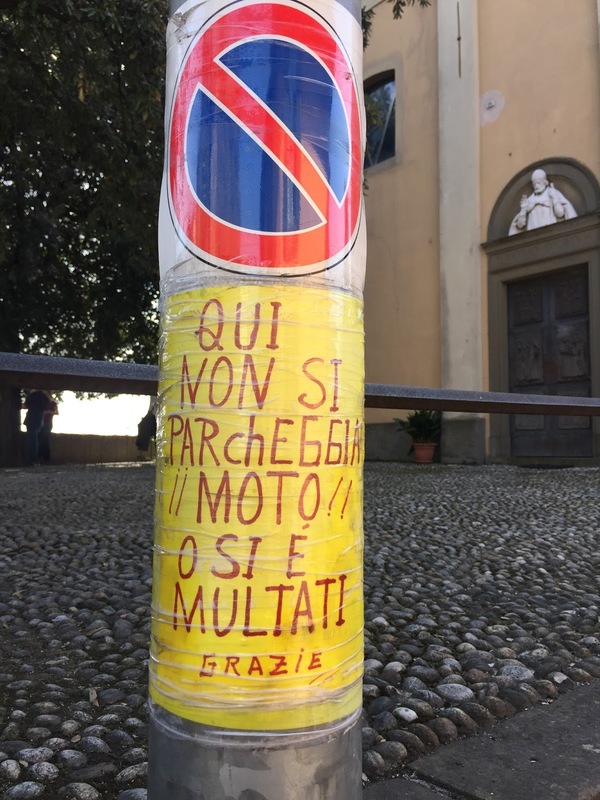 Bergamo signs. 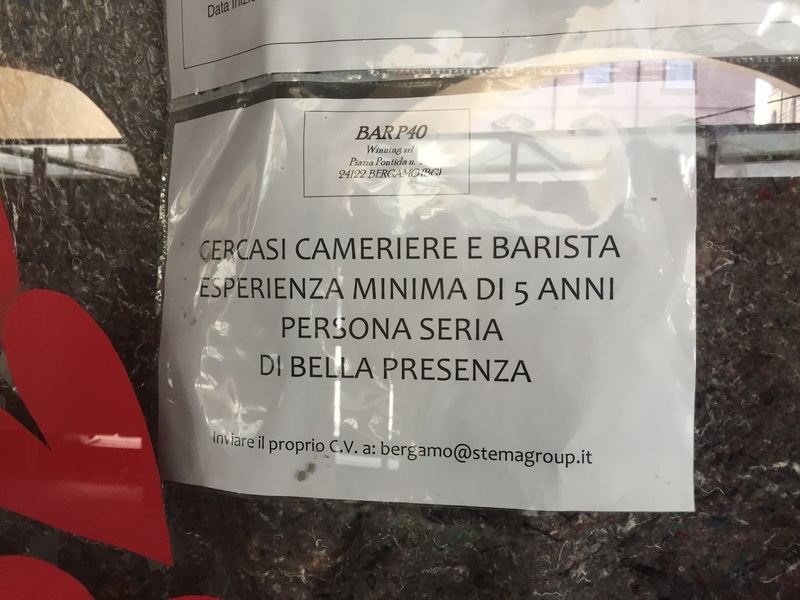 Left: Looking for good-looking staff. Center: Coughing up blood. Right: Warning to not park motorcycles. P40 is a bar/restaurant in Piazza Pontida. It was the very first place we ate at when we arrived in Bergamo. Now, we never go there because it’s like dining in a glass fishbowl filled with smoke. Apparently, if you are ugly, you need not apply for this job. I can’t tell you how many of these discarded cigarette carton have caught my eye. (I scream inside: pollution damages the environment as well!) This box was sitting near an ATM. 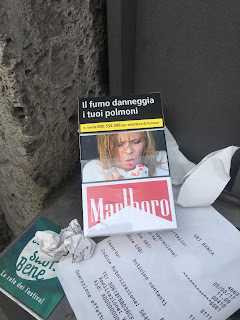 Cigarette cartons have different eye-catching, and often gross, images to dissuade people from smoking. I wonder how effective these images are for reducing tobacco use (tobagismo)? This cigarette carton features a woman coughing blood into a handkerchief. 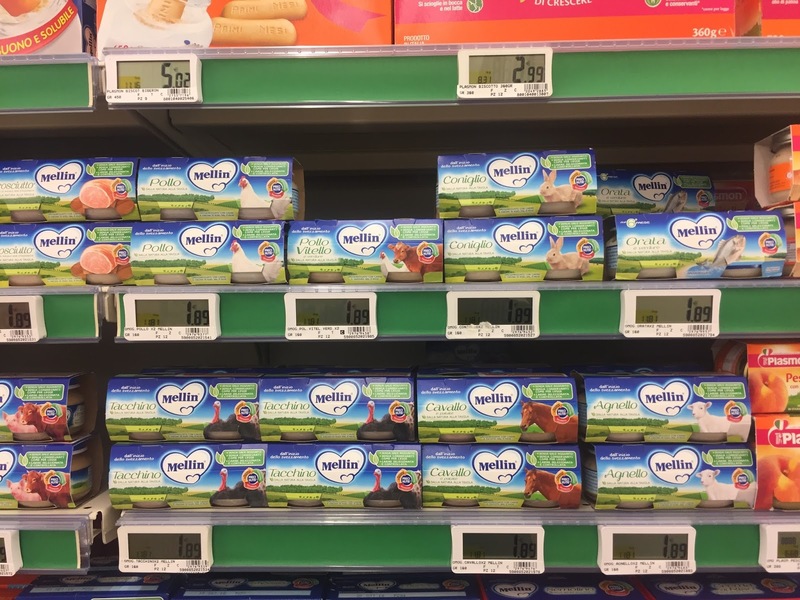 According to Tobacco Control Laws (European Union), warning messages must take up to 65% of front and 65% of back, and be rotated every so often. Here are some other messages you might see on cigarette packages. I’ll admit it, impersonal forms in Italian confuse me. Let’s see if I don’t muddle this explanation too badly. In the first part of the sentence, we are dealing with the transitive verb to park (parcheggiare) used passively: a motorcycle (moto) is parked. For this case, technically called si passivante, the best translation would be “motorcycles are not parked here” or simply “no motorcycle parking”. In the second part of the sentence, we are dealing with an intransitive verb (essere “to be”). This case is called si impersonale and depending on context, the phrase could refer to “one”, “you”, “they/people” or generically “it”. “You” is about right for the tone of the message, which is aimed at the person thinking about parking a motorcycle. 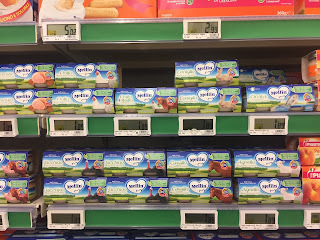 Note that multati (plural) and not multato (singular) is used because you always use plural adjectives in si impersonale even for singluar verb (si è). 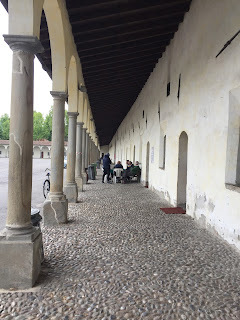 Il Lazzaretto, Bergamo. Left: Men playing cards. Center: Big green area in the middle of Il Lazzaretto. Right: Sign for Cell 65. 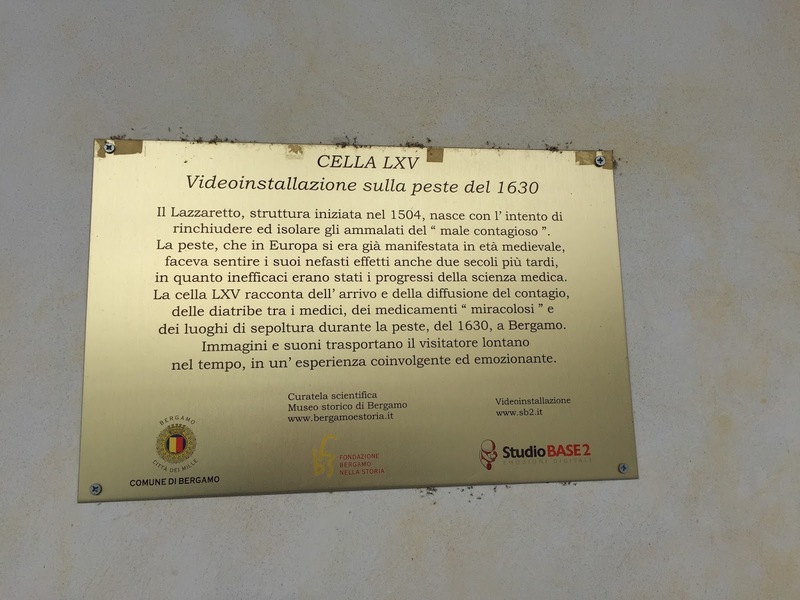 Cella LXV – Video installazione sulla peste del 1630 – "Cell 65 – Video installation on the plague of 1630"
This sign was at Il Lazzaretto of Bergamo. The word lazzaretto in Italian means hospital for lepers and people with infectious diseases like the plague (la peste). The Il Lazzaretto consists of rooms (really cells or celle) arranged a large square porticoed courtyard. Each cell has a door and window, which open on to the courtyard. At the time costruction started in 1504, the building was outside the city walls (Città Alta). The building was expanded to accommodate the increased number of infected from the plague of 1576. Il Lazzaretto saw increased use again during the plague of 1629-1631. 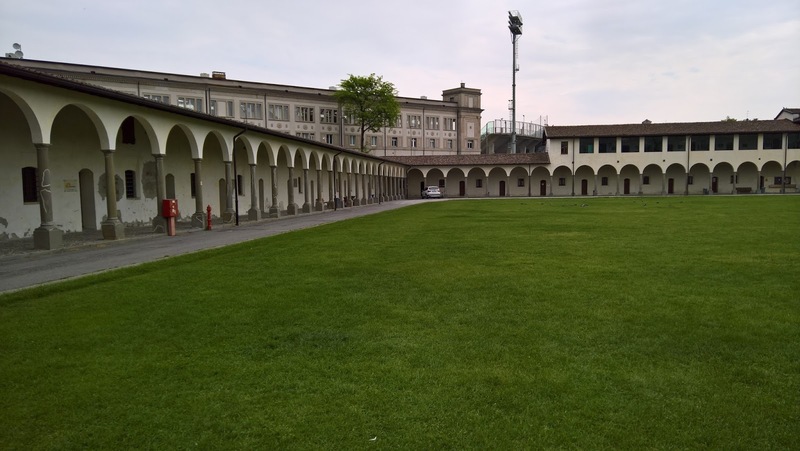 Today Il Lazzaretto is part of Bergamo Infrastructure, and the cells contain offices for various organizations and groups in Bergamo. 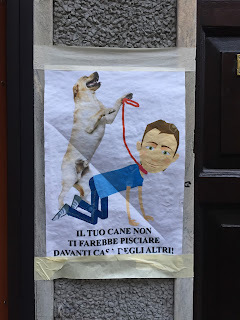 Various signs around Bergamo. Left: Your dog doesn't make you pee. Center: Knife sharpening. 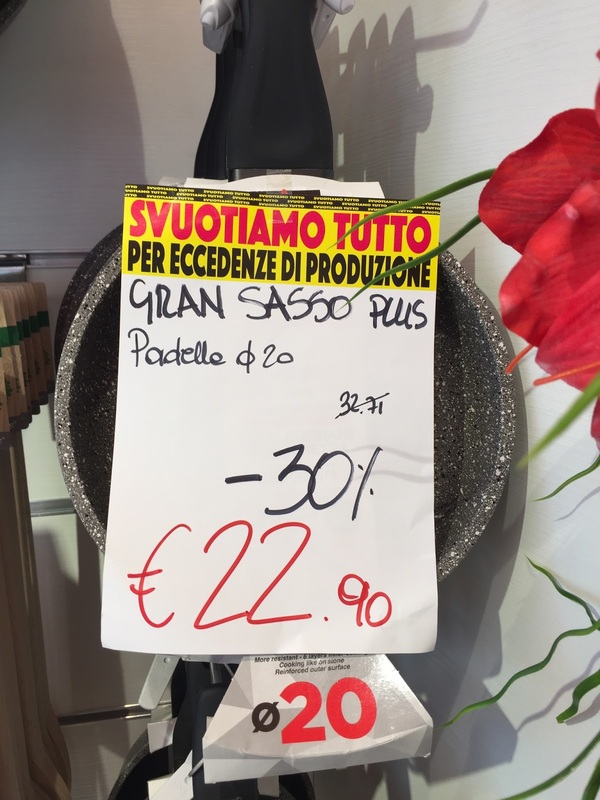 Right: Cheap pots and pans. I couldn’t let this dog sign go by without a comment. It’s certainly one of the most interesting we’ve seen on the subject of dog waste. 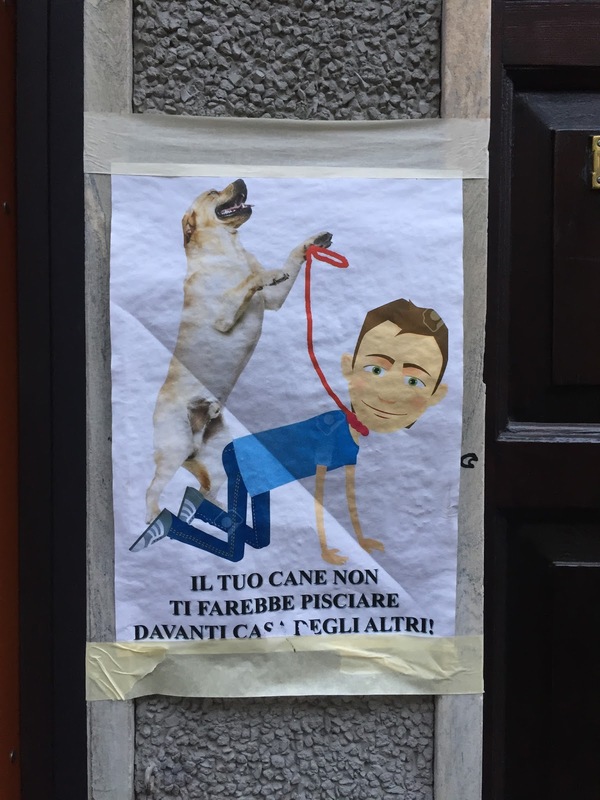 The sentence uses the causative fare + verbo as in non ti fa pisciare (“he doesn’t make you pee”) with the addition of the conditional mood to become non ti farebbe pisciare (“he wouldn’t make you pee”). There is something creepy about the position of the dog and its owner. 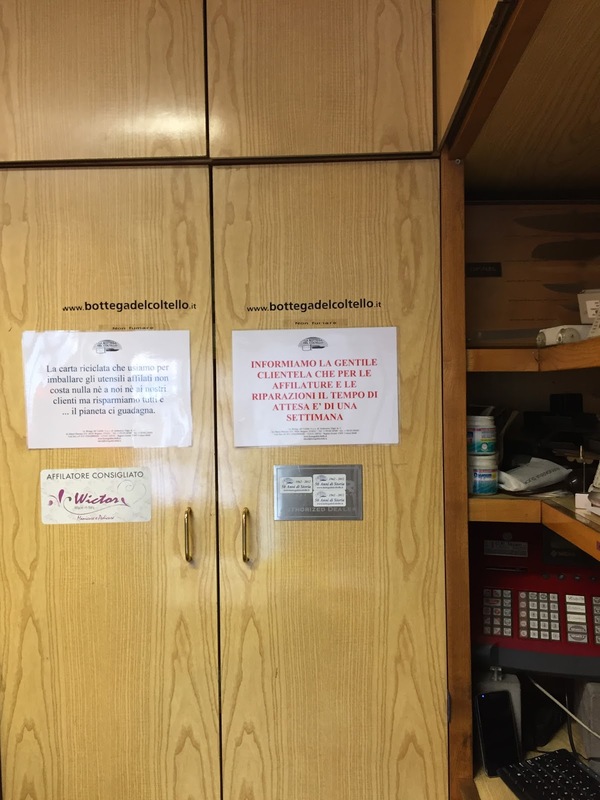 Informiamo la gentile clientela che per le affilature e le riparazioni il tempo di attesa è di una settimana – "We inform our clients that for sharpening or repairs there is a one week wait"
This sign was spotted at the Bottega del Coltello in Santa Caterina. It’s a great place to go if you are looking for a high-end knife. The noun affilatura is “sharpening” and the related verb is affilare is “to sharpen”. This sign was spotted at the Barazzoni Outlet store in Bergamo. 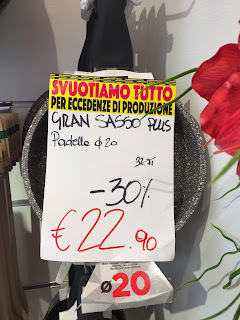 We confess to buying a few things there because the Agnelli Outlet store was too far away and a bit pricier. The sign uses the verb svuotare, “to empty or gut”. 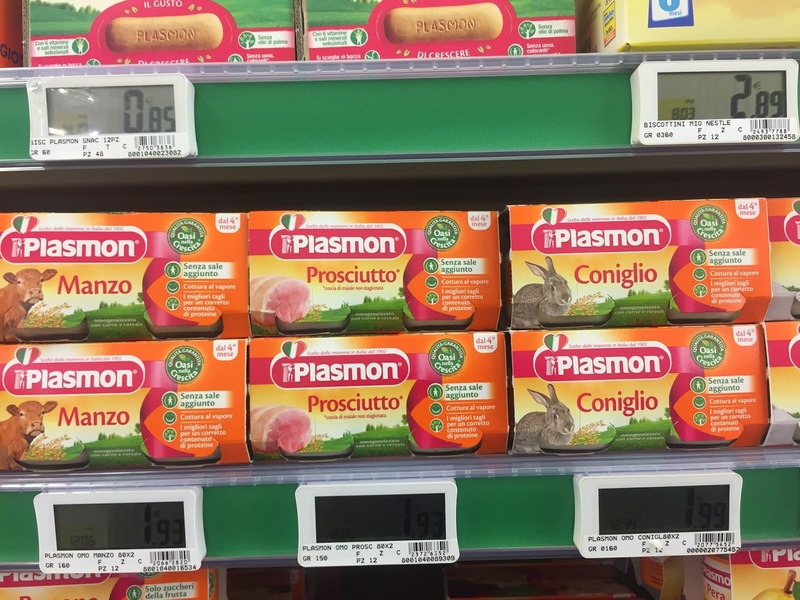 Left: Baby food choices in Italy including horse, rabbit, and lamb. 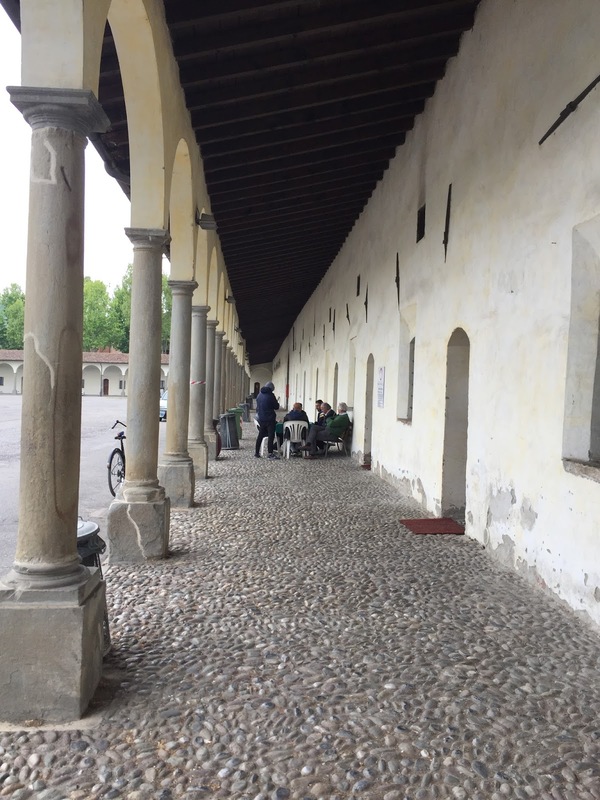 Right: Inside the Museum of the 1800s in Bergamo and a silkworm explanation. 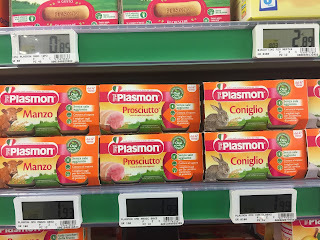 Manzo, prosciutto, coniglio, tacchino, cavallo, pollo, agnello, orata – "Beef, ham, rabbit, turkey, horse, chicken, lamb, gilthead bream"
These are choices for baby food that we saw at a grocery store. I only got mushed carrots and peas when I was a baby. 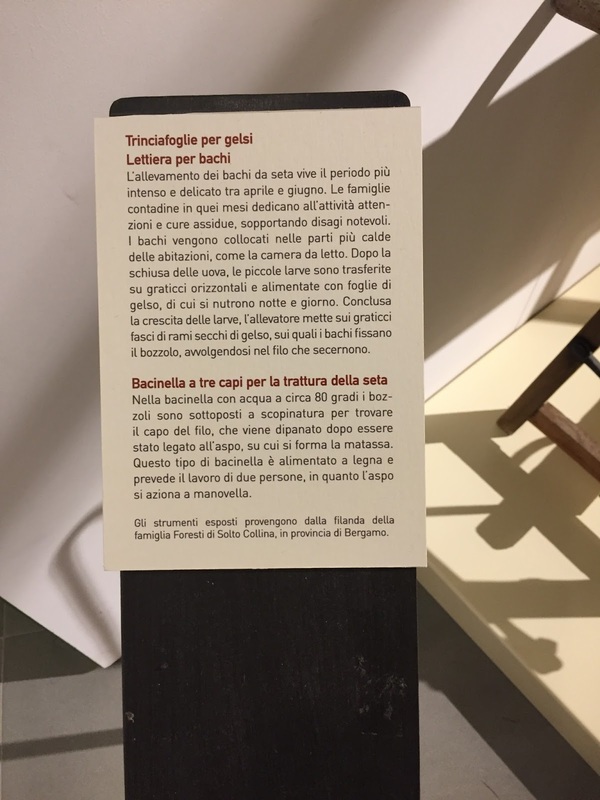 Trinciafoglie per gelsi, lettiera per bachi – "Mulberry leave cutter, bedding for silkworms"
This sign was seen in the Museo Ottocento, part of the Fondazione Bergamo nella storia museum complex, that deals with the history of the 1800s in Bergamo including bachicoltura or the breeding of silkworms (Bombix mori). 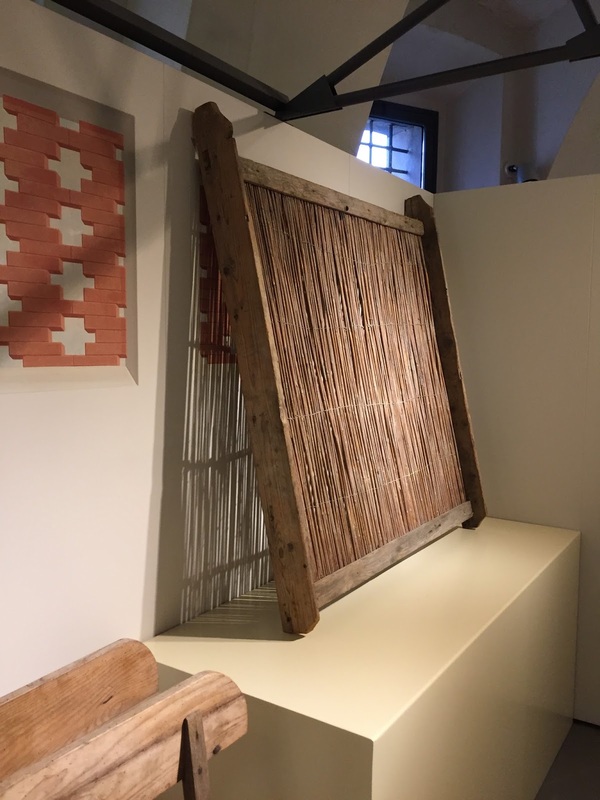 The raising of silkworms and production of silk in the Bergamo province, as well as much of northern Italy, was huge. The industry suffered a setback in the second half of the 1800s when the pébrine (pebrina in Italian) parasite struck. Silk production limped along until its final decline in the 1900s, killed off by external competition, the introduction of synthetic materials, and migration of people to the cities.